Louis Jacques Filion and Michel Patry. 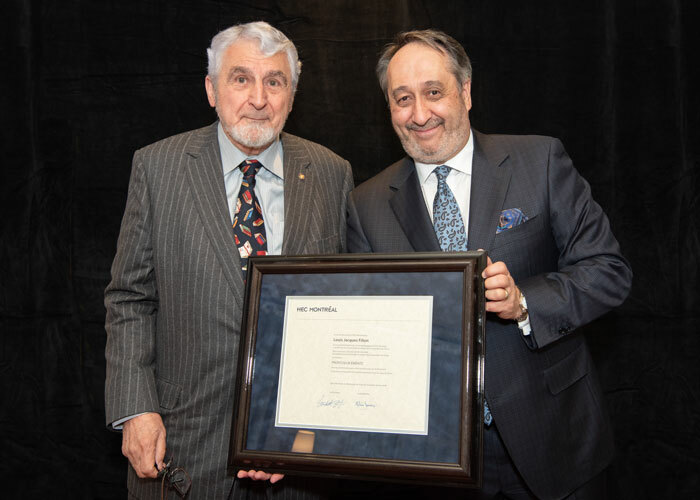 Louis Jacques Filion was officially granted the title of Professor Emeritus at the School’s award ceremony on November 28. This distinction comes as a tribute to his outstanding contribution to teaching, research, and the development and renown of HEC Montréal. Professor Filion worked at the School for over 20 years, beginning as an associate professor in the Department of Management in 1993. From 1995 to 2016, he held the Rogers – J.A. Bombardier Chair of Entrepreneurship. He helped create the Centre d'entrepreneurship HEC-Poly-UdeM in 1996. He was also a driving force behind the creation of the Department of Entrepreneurship and Innovation in 2014. Before joining HEC Montréal, Professor Filion was a professor at the Université du Québec à Trois-Rivières, where he directed the Master’s in SMB program and created the Centre d’entrepreneuriat du cœur du Québec, among other achievements. Aside from his academic duties, he also held several management and advisory positions in public and private organizations. In 1991–1992, he served as President of the Canadian Council for Small Business and Entrepreneurship (CCSBE–CCPME). He holds two Master’s degrees, including an MBA from HEC Montréal, as well as a PhD in Systems and Entrepreneurship from the University of Lancaster, in Great Britain. Professor Filion has had a far-reaching influence on entrepreneurship, as he has zealously promoted it as a subject of study and research. He has taken part in a large number of seminars, symposia and roundtables on the themes of entrepreneurship and SMBs, in Quebec and internationally. Professor Filion has explored the subject of entrepreneurship from a multitude of angles. Over the course of his career he has produced more than 200 publications, including 28 articles under his name in scientific journals, and upwards of 100 peer-reviewed papers published at symposia and in applied journals in six languages. He also published 17 articles in some of the most recognized scientific journals in Brazil. He is the entrepreneurship author most cited in scientific periodicals in that country. He has written some twenty books, many of them bestsellers in both France and Quebec, and a dozen have received awards for their quality. He has also authored or co-authored over 200 case studies and some 100 teaching documents. Lastly, Professor Filion’s influence has made itself clearly felt in his commitment to his students. He has supervised the dissertations of PhD students now teaching in Canada, Brazil and Colombia, sat on many thesis committees and supervised numerous Master’s students.